Three years ago, my dear friend purchased a 1963 ranch home in the Oakland Hills. The house was structurally sound, had plenty of room for her expanding family and was a cosmetic "fixer". There is so much to like about this home, the built-in dressers in the master bedroom, the wall hung vintage toilets, the floor to ceiling windows and the courtyard in the center of the house. (The house is shaped like a U). Almost immediately after her family moved in, plans were drawn to transform this rancher. 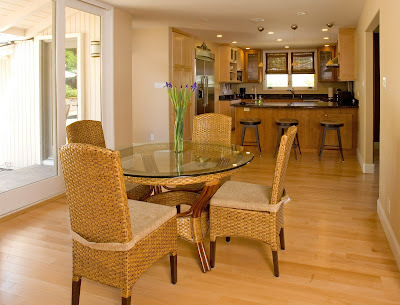 Walls were taken down so the kitchen and family rooms formed a great room. 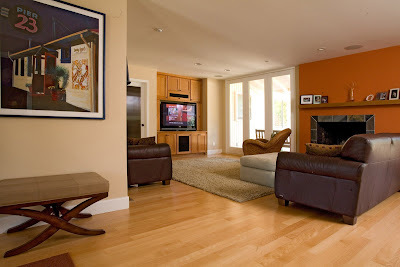 An extra door was cut into the family room to bring more indoor-outdoor access. The carpet was removed and hardwood floors were installed. 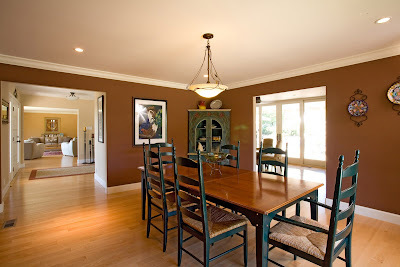 (This home was built without hardwood floors in the living room, dining room and family room.) Texture and depth was added with a slate fireplace surround in the family room, maple and cherry wood cabinetry in the kitchen and warm and earthy paint colors warmed the walls. This California rancher is full of life! I call this an artistic, cozy, mid-century modern.